This was a delightful day! Although in the evening I was very tired I had a great time. 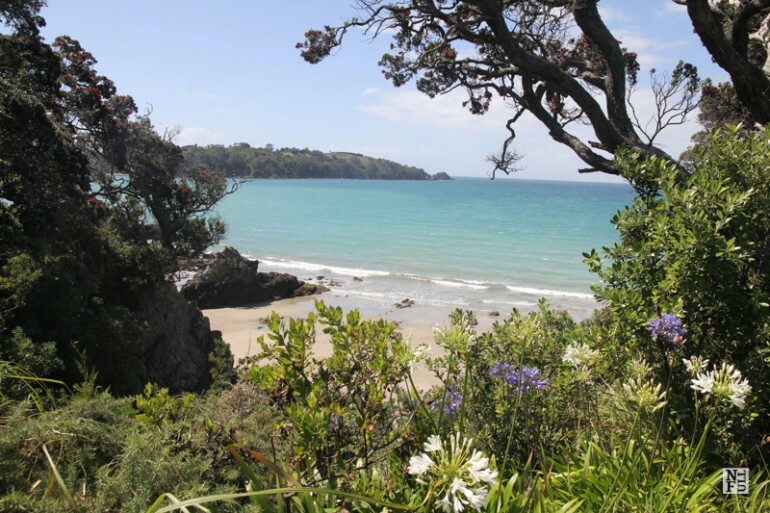 It is the middle of the summer here, in New Zealand so last Saturday I went to Waiheke. 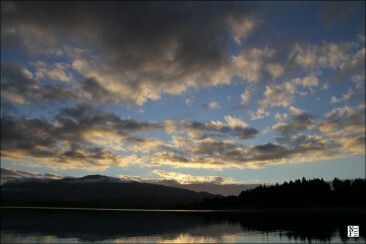 This is a popular recreational destination, not only for tourists but most of all to Aucklanders. It is easily reached by a ferry from downtown Auckland. A ride lasts about 35 minutes and a ferry goes every hour. Not always, popular places are beautiful. It often happens I am disappointed with top touristic sites. But this was not the case of Waiheke. Although there was a crowd on the ferry the island is large enough to accommodate all visitors. First, I went by bike, which was a challenge itself. I’m not a great bike rider as you probably remember from my previous post on Aran Islands, but I enjoy recreational riding just like I did in Athens. Anyway, this was a different story because Auckland is very hilly city and Waiheke Island too. Bikes on a ferry to Waiheke. The great thing about this trip was that I could take my bike to a ferry for free. I was wondering why more people do not do this. 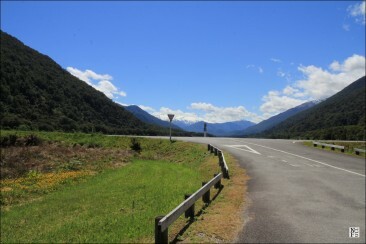 After all I checked the price for bike rental on the island and 50 NZD daily rate seemed to me very expensive. But soon enough I knew why people rarely take bikes with them. Making the long story short: Waiheke Island is very hilly. I was not prepared for this! 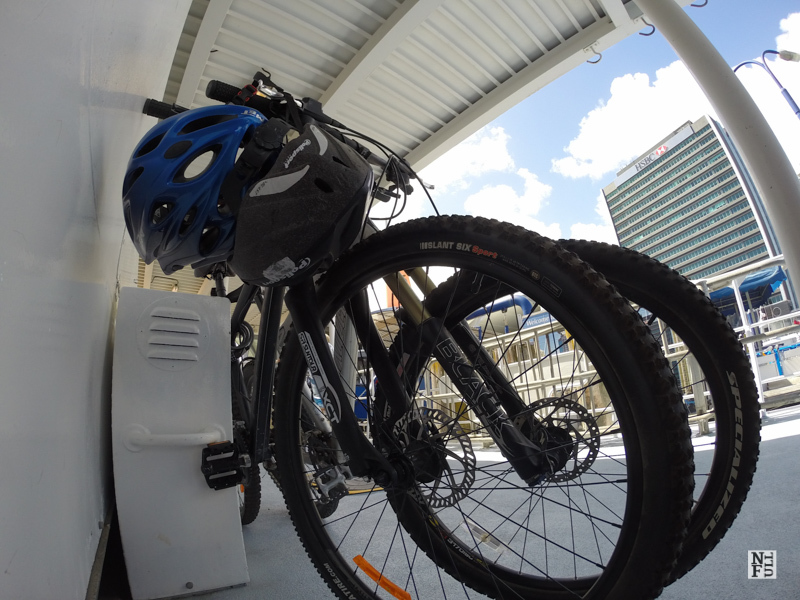 The first part of the trip – from Kingsland where I live in Auckland to harbour – was downhill but the moment I started my ride on Waiheke I thought I should get back home at once! First kilometer was uphill and I felt like my legs and lungs were burning. And it was no better further: up and down for next 9 km! Only because I was really determined I eventually reached my destination: a winery and restaurant “Wild on Waiheke”. Waiheke is called the island of wine. There are as many as 25 wineries on this island and most of them offer wine tasting, restaurant, garden and a place to have your party in. I tasted few wines in ‘Wild on Waiheke’ and I can tell you this: if only for wine this trip would not worthy my effort. Now, I know this might be due to my previous experiences in Italy and my particular taste shaped by Italian wines (not luxury nor expensive but still). And I really understand people who go to Waiheke to taste wines. I do! After all, this wine was better than the one I had in Paris (shame on you!). 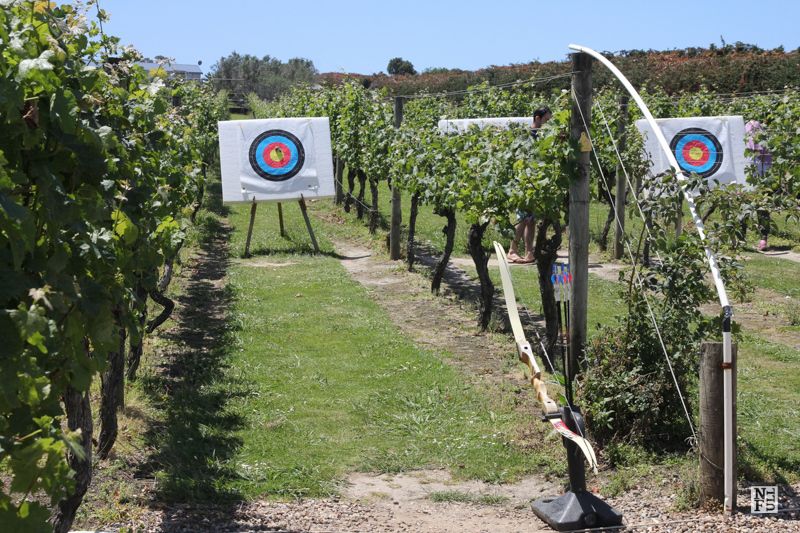 Waiheke Island is not only about wines but also other activities! 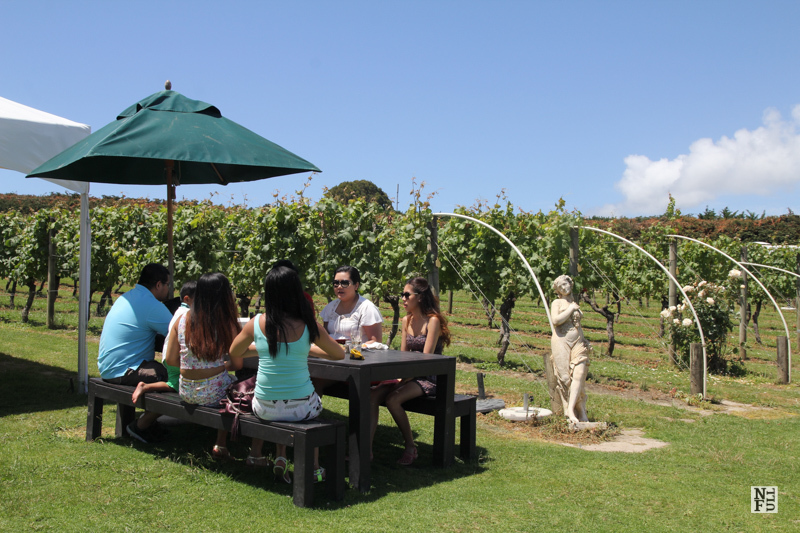 What is really great about Waiheke and wine tasting is that you can have a very small glass with your meal for just 2 NZD. 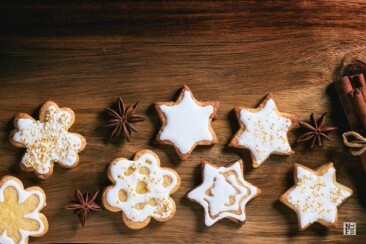 It allowed me to taste as many as 4 different ones and I did not have to spit! The more friendly version of professional wine tasting. Just for people like me and a million of Aucklanders who come here. If not wine than food! What else makes you determined enough to ride up and down for an hour? 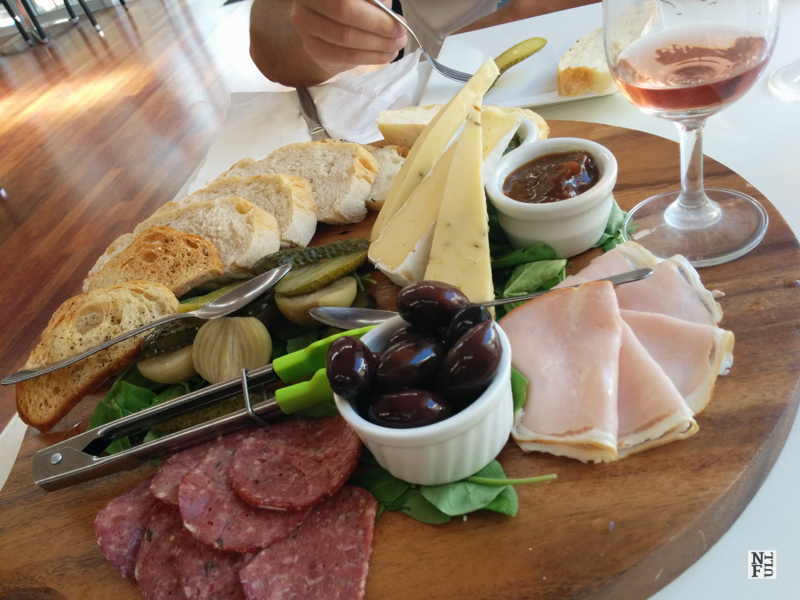 “Wild on Waiheke” provides high quality and very tasty food. Their garlic bread, salad and a variety of cheese and ham were excellent! Also, people who work there are friendly and helpful. When I arrived at noon all seats and tables were taken but they were still able to find a place for me. I had a look at ‘typical’ Kiwis having a great time. These people are chilled out beyond my imagination. They are not slobs, though. They keep their being chilled out well balanced so people who watch them do not feel embarrassed or disgusted. 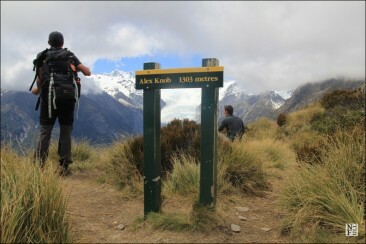 Kiwis chill out makes you relaxed and eager to share their state of mind. In this restaurant, I felt like being a part of a big party. Even though people did not know each other it still felt like somebody’s wedding. And let me tell you that the dress code was not wedding focused! The best part about this island is landscape. I was riding a bike and at some point I felt really exhausted but it did not prevent me from watching breathtaking views. Little bays, hidden beaches, gentle green hills, white boats on the water and blue sky over all of this was a reward for riding uphill. Just like elsewhere the middle of the summer makes a place colourful and smelly (in a good sense!). A variety of trees and flowers is delightful here and the whole island was like a big garden. What I found most amusing was a popularity of this place. Yes, it is beautiful but often this is not good enough for people to come. Apart from a chill out of New Zealanders I can’t still well understand I think creating new trends works really well here. Wine has become a desirable and widespread drink recently. It is fancy to drink red wine instead of anything else. So people do. They have their favorite wines but also visiting a winery for a day became a great idea for a weekend. 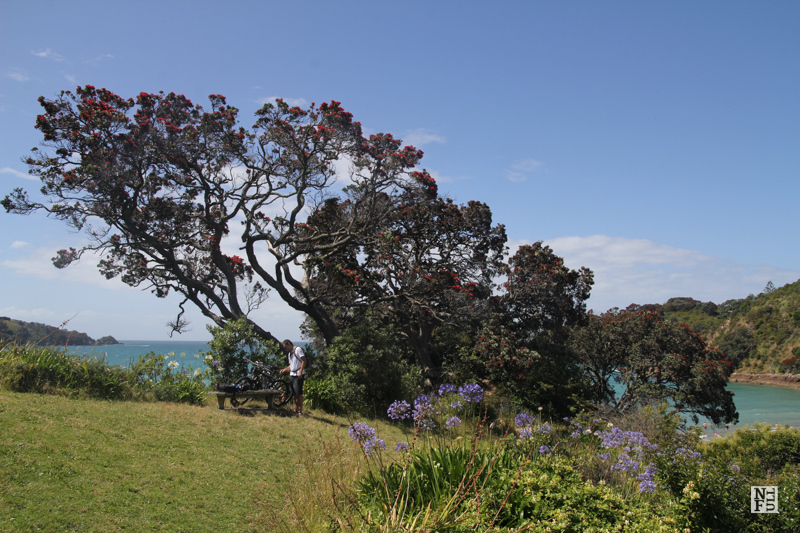 Waiheke would be still beautiful without wineries but for its beauty people would not come. 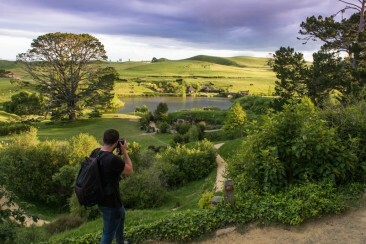 If you are spending your summer in Auckland this is a great one-day trip. I think it is worthy to visit this island for its atmosphere, beauty and for people. I enjoyed my stay there very much and I hope to go back there soon. When you take a ferry don’t sit on the back lower deck. I did and after 15 minutes I was completely covered with salt and water. I looked like a wet chicken and for the whole day I had sticky hands. So make yourself comfortable inside the ferry. 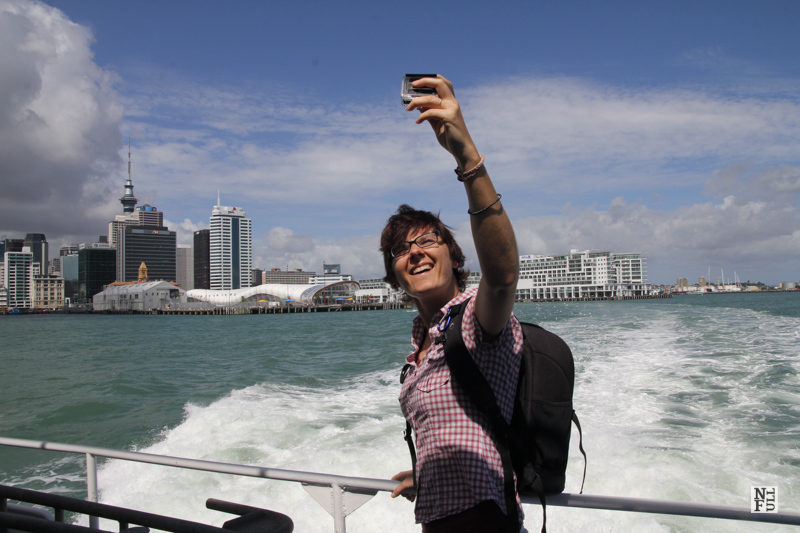 A tourist on Waiheke ferry. It’s me.